I had really hoped to share pictures of the new Ozotic Scatter Chromes today, but I was out the backyard this afternoon when the DHL man arrived and I missed my nail mail. Boo hoo! Plus I had the afternoon off work so I would have been able to swatch them all. Now I will have to wait until the weekend. 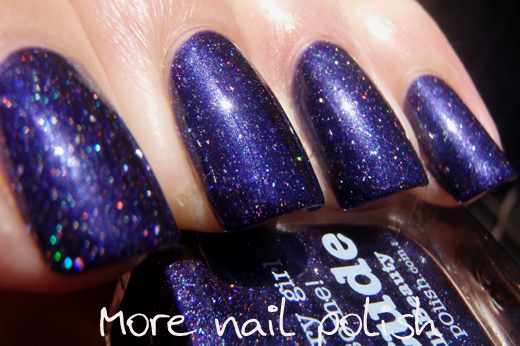 Damn you well paying job that I need to fund my polish habit *shakes fist*! Instead I have two more Picture Polish shades to share with you today. I was really excited when I first saw pictures of Dorothy. 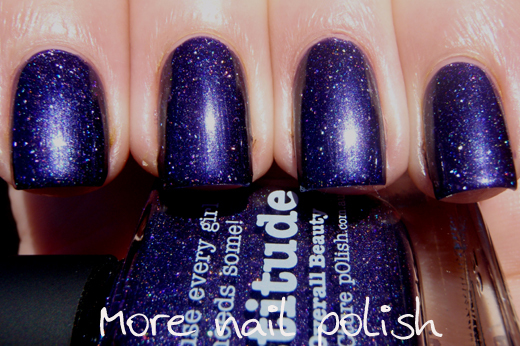 I was always going to get this polish, cause it bears my mum's name, and my mum would definitely be my closest nail buddy! 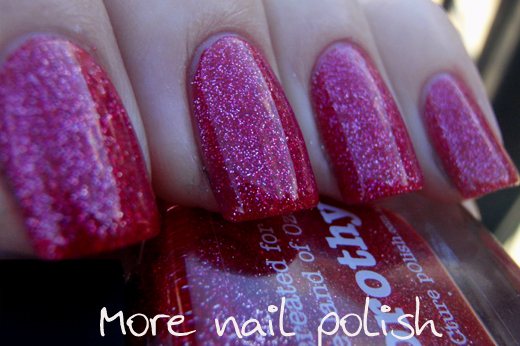 Dorothy is a red jelly polish that is jam packed full of silver micro glitter. 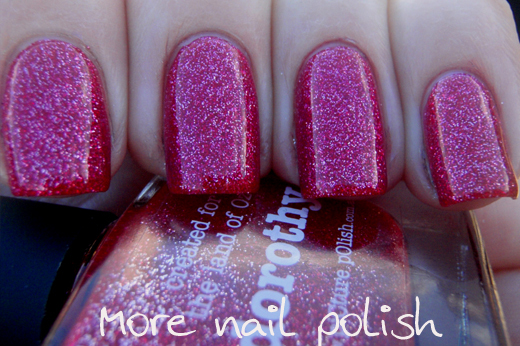 Because of the silver glitter this polish leans very pink. In fact it looks more like a dark pink polish than a red. 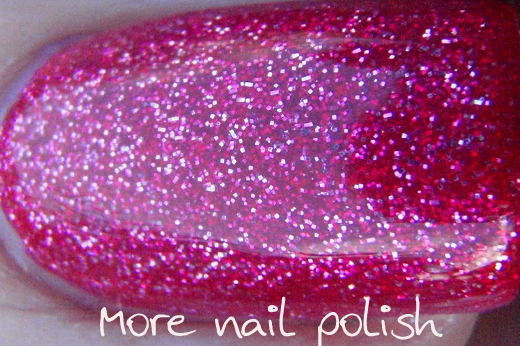 It's a little thick to apply because of the quantity of glitter, but it covers very easily. This is two coats of dorothy and two layers of top coats to get it smooth. Attitude was another shade I was really looking forward to trying. Because it was a purple large particle scattered holo, I thought it might by like the purple Ozotic large particle scattered holo, #624. However it is absolutely and completely different. Ozotic 624 is a very red toned purple, whereas this is much more blue toned and much much darker. 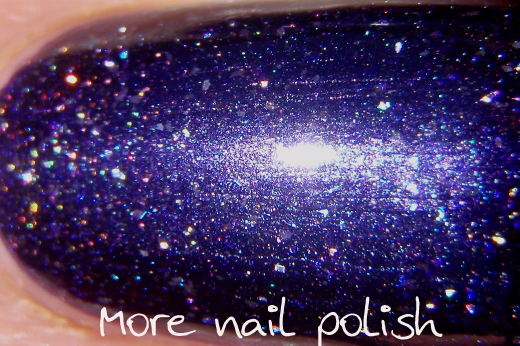 This also has a strong purple shimmer and isn't really a jelly finish (although it is transparent enough to see through to the holo particles and get some depth). 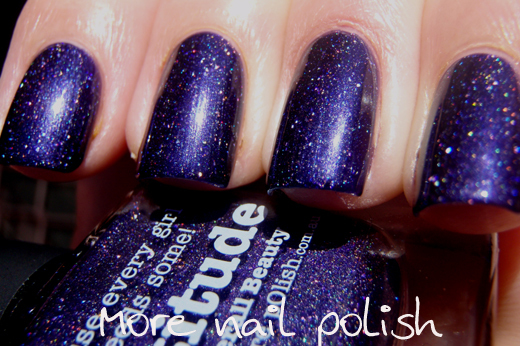 This is three coats of attitude with Seche Vite top coat. love the colors and the finished look! I was going over etsy today and thought of ordering an my first indie polish.. but gaahhhh! couldnt decide.. could you please name a few of ur fav etsy-ies? Hmmm - I guess it depends if you prefer glitter bombs or shimmers. I would happily recommend any of the indie brands that I have tried. They're both amazing and your pics are gorgeous! !